Replace Or Repair That Old Vacuum? We recently had a customer call looking for advice on whether to repair or replace his vacuum. The situation made for an interesting case so we figured we would post in a blog in hopes that others can find some value in this common scenario. The customer who posed the question, let’s call him “John”, started out by saying he just had his carpets cleaned and wanted to maintain that fresh look for as long as possible. The only problem, his vacuum wasn’t performing as well as it should so John was considering replacing it. John also mentioned he had a dog and he and his family were very hard on the carpets. John went on to mention he had taken his vacuum apart, cleaned everything out and it still wasn’t working up to par. John’s actual inquiry was more along the lines of whether or not he should accept that middle of the road vacuums are dispensable and is it worth spending the big bucks on a Dyson. The answer to John’s inquiry isn’t as simple as you’d think. 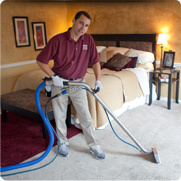 The reality is, over time, your carpets are bound to gum up any vacuum – Dysons are no exception. The real question boils down to how much routine maintenance you’re willing to do. Let’s examine this a little further. Our first question to John was “did you like how your vacuum performed when it was new?” John responded by saying he was quite pleased and had been trying to restore its effectiveness ever since. We then asked John to go into further detail regarding the level of maintenance he’d performed on the vacuum. John did a commendable job of taking his vacuum apart – blowing out the hoses, filters, etc. John then went on to mention that after all that, the vacuum’s hose suction was very powerful, but the vacuum’s brush was barely working at all. It was evident John missed two key components while cleaning out his vacuum. There is a filter between the brush and the vacuum. This filter is typically easy to access, but also easy to miss. Keep this filter clean. You can even wash it with water. To the right is a Bissell 89Q9-4 with the brush filter exposed. It is important to keep your vacuum’s brush belt in tip-top shape. Inspect it regularly and remove hair or anything else that prevents the roller from spinning freely. If the roller can’t spin, the belt overheats and stretches (overheating can often be detected by the smell of burning rubber). If you suspect this is happening, replace your brush belt immediately. John called a few days later to thank us and mentioned his vacuum was running like new. If you find yourself in a similar situation, remember that vacuums are only as good as how well you maintain them. The more spendy models are no exception. Find this post useful or have anything to add? Please use our contact form and Let us know what you think.